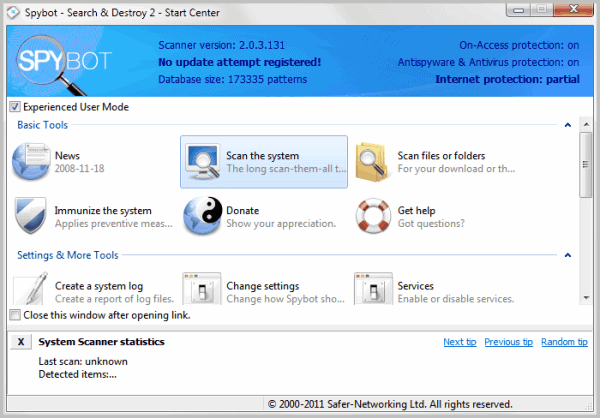 The developers of the popular antispyware scanner and cleaner Spybot-Search & Destroy have released a first public beta version of the soon to be released version 2.0 of the application. You will notice right away that the Spybot application has turned into a heavyweight over the years. The 66 Megabyte download indicates this already, and it is later confirmed during installation. The sheer amount of tools and services that you can install, or will if you do not select the custom installation option, is confirming this impression. 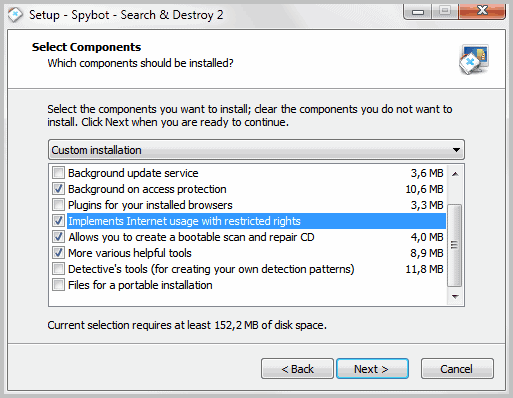 The average Spybot-Search & Destroy 2.0 installation will take up more than 120 Megabytes of space on the system. You can select the custom installation option to enable or disable some of the tools and services that are offered in addition to the core program files and functionality. Among those are browser plugins, background services, for instance to perform program updates, or a tool to create a bootable CD to scan and repair the PC. The program asks you to restart the PC after installation. Some functionality is however directly available without restart. You can for instance run the program without restart, or perform update checks and file scans. The options in the interface are displayed on a scrolling page, which makes orientation a lot harder. An option to switch to a list view is missing. You should run an update check on first startup, to make sure that the program libraries and database are up to date. The available selection on the main page depends partially on the type of installation. Some options may not be there if you have customized the installation. A full scan of the system, or a scan of individually selected files or folders can be started under Basic Tools. 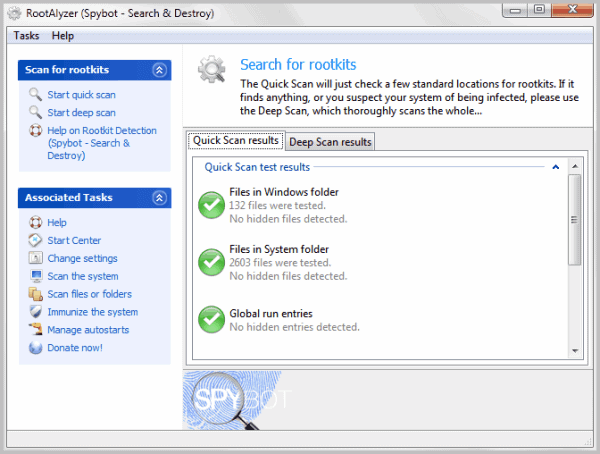 Spybot-Search & Destroy scans the system for installed spyware. Especially the full system scan takes a while to complete. It took more than 25 minutes on a fast test system with fast cpu, lots of RAM and speedy Solid State Drives. Scanning is only one thing that you can do with the Spybot program. You can use it to manage Windows autostart entries, scan for rootkits, shred files or scan mobile phones that are connected to the PC at that time. Some users may think that this is overkill, while others will love the extended tools sections that they can use to manage other parts of their operating system. Spybot feels bloated just like the burning software Nero does nowadays. Users who only want the spyware scanning should use a custom installation to remove all additional tools that are installed otherwise with the program. Keep in mind that it is a beta release, which means that things may change and that bugs may exist. You can download Spybot-Search & Destroy 2.0 Beta from the official website. The program is compatible with 32-bit and 64-bit editions of the Windows operating system. I used to use Spybot. But it wasn’t useful because when I would run a scan and then want to examine individual items that came up, either links to further info (like into the registry) didn’t work or there was no info available. So I dumped it. Perhaps I will give it a try again once it gets out of the 2.x beta although I am not running into any problems with my machine with this app deleted. I take a closer look once the final version gets released. So has it been released wether or not this version will come with the keylogger that the original came with? Do you mean “anti-keylogger” or are you donning a tinfoil hat? Oh no… I mean acctual keylogger. If you look back in tech news, the very first version released contained a keylogger, they were forced to release an imidiate fixed version. Not that they will admit to it now. I’m not saying it was for malicious purposes, but it was there none the less. Interesting, I didn’t know that. I tend to give them the benefit of the doubt in this case. It’s actually quite easy to accidentally create a keylogger, especially when writing games. A program that waits for a user to perform an action with the keyboard may inadvertently monitor -all- keystrokes, instead of the ones it should be looking out for. 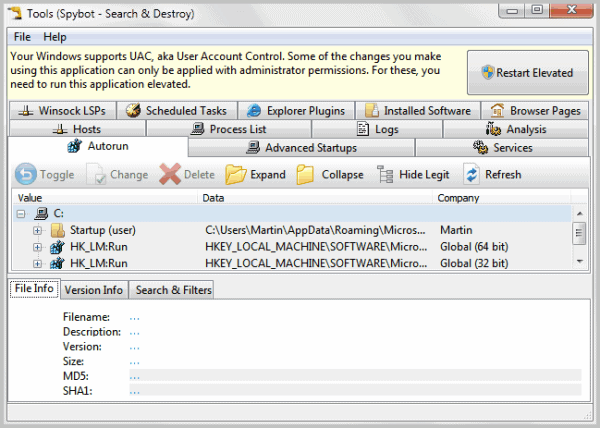 The real issue occurs when the program “logs” actions performed, as these can be converted to a keylog. Do you have a link or more information about this. 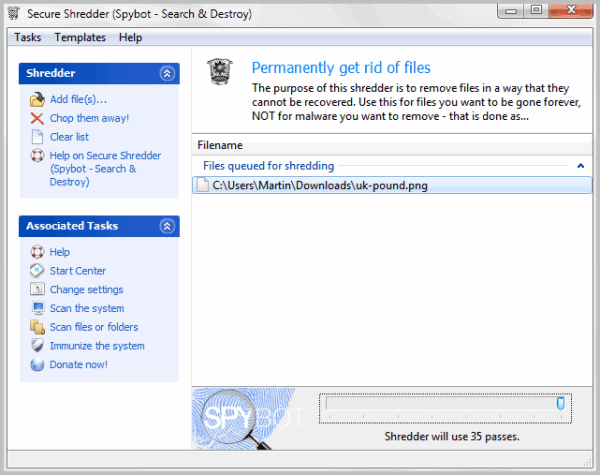 I have been using Spybot for years and it saved my PC quite often. Are you really sure you are referring to Spybot – Search & Destroy and not one of those rogue lookalikes.